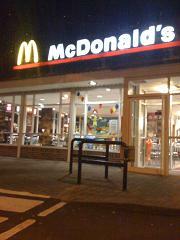 McDonalds in Glengormley with a drive through. Have you got Google Earth on your computer? If so, then download the Google Earth Map of McDonalds Glengormley. Is this the wrong position for McDonalds Glengormley? If you think so, then modify its position. very clean, very nice resturant. employees are very friendly, the employee that served me (chloe) was very well mannered and very helpful.